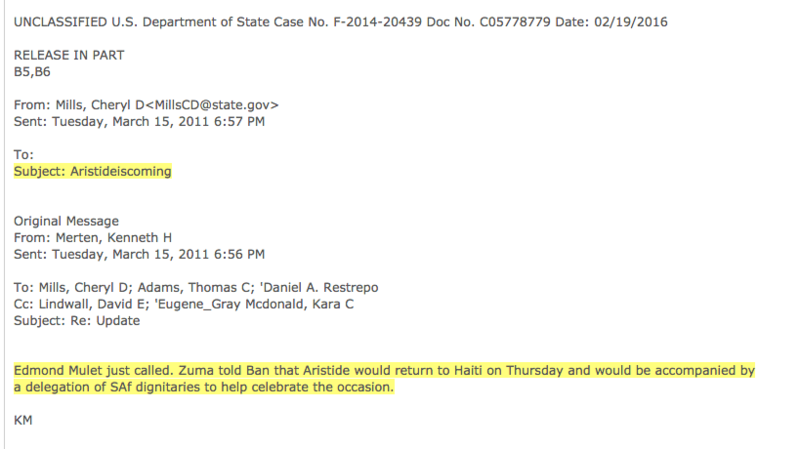 State department is concerned that Aristide might try to return to Haiti. 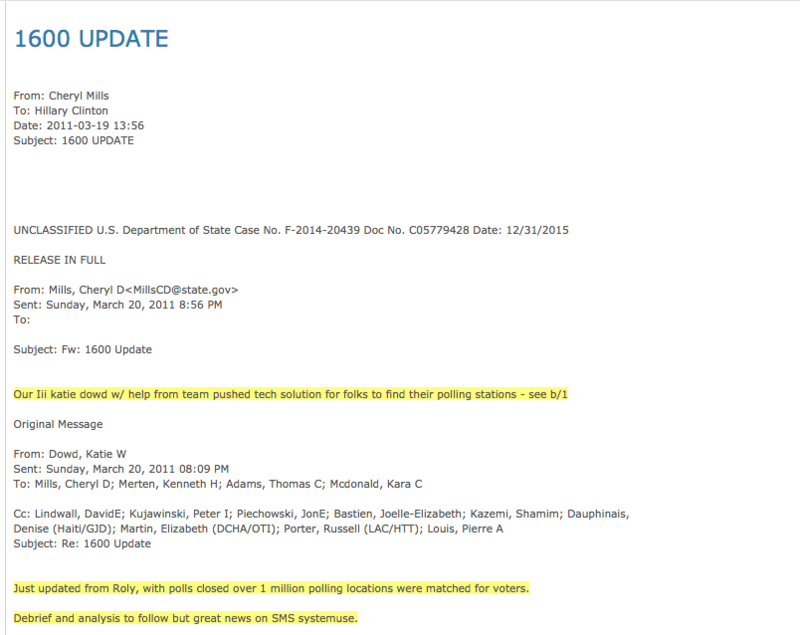 A “major developments report” sent by “MDM” states that Haitians are fed up with Preval rule. They want him out and Aristide in. 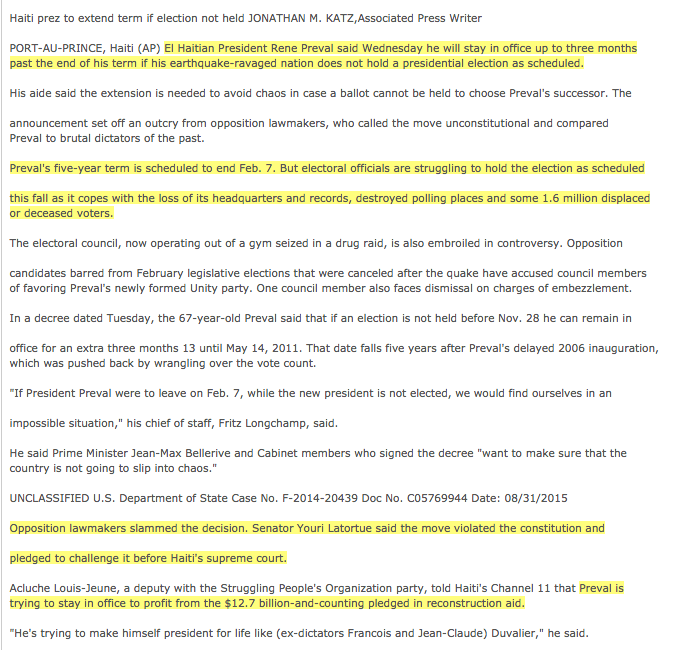 Preval threatens to extend the election. Rumor has it he wants to profit from reconstruction aid. Baby Doc returns to Haiti. 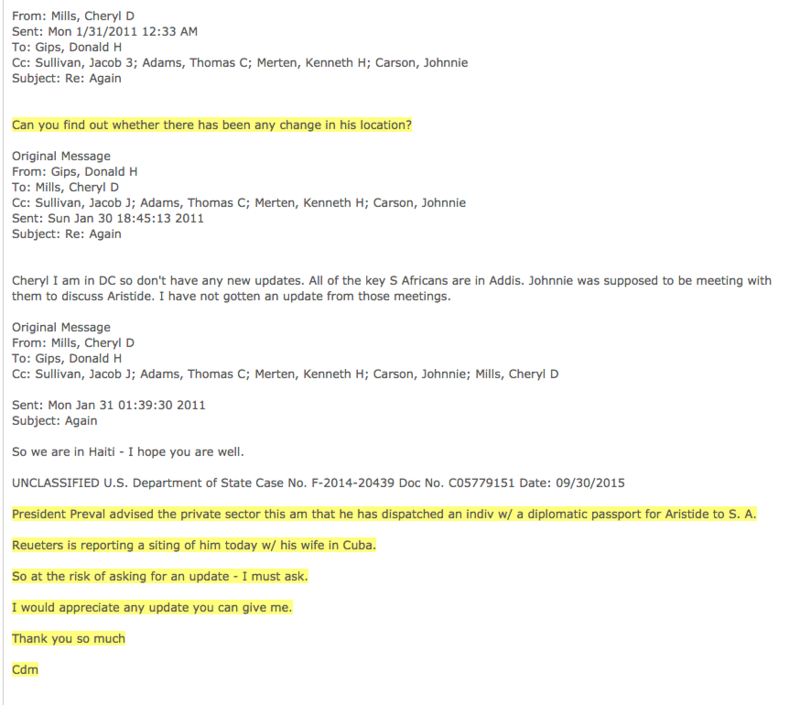 State department receives word that Aristide may have left Africa and is in Cuba. They request more intel. 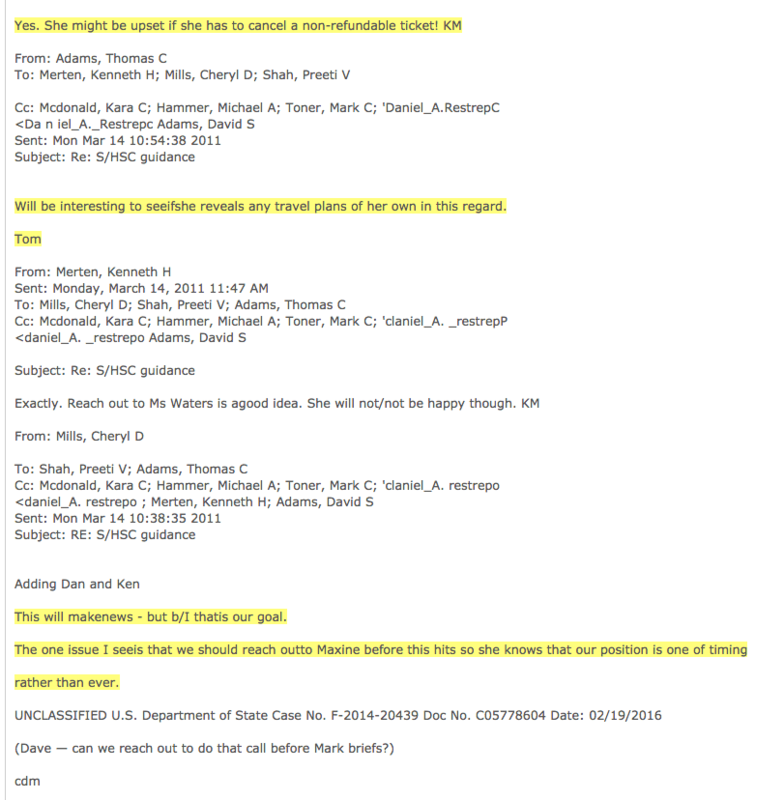 Cheryl Mills, Kenneth Merten, and Thomas Adams discuss notifying Rep. Waters to give her a head’s up that they were not preventing Aristide from returning to Haiti ever, just until after the elections. 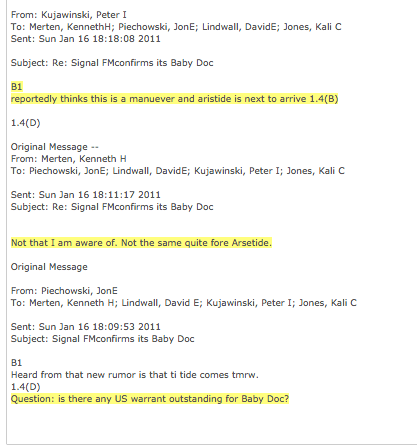 4:12 pm Email confirms Aristide’s return. 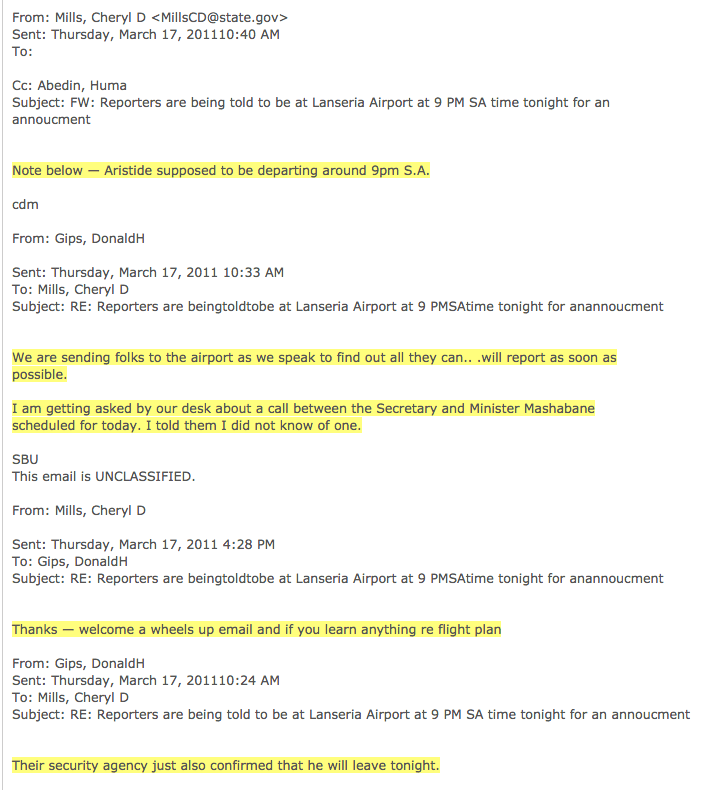 6:57 pm State Department receives information that Aristide will return on Thursday, March 17. 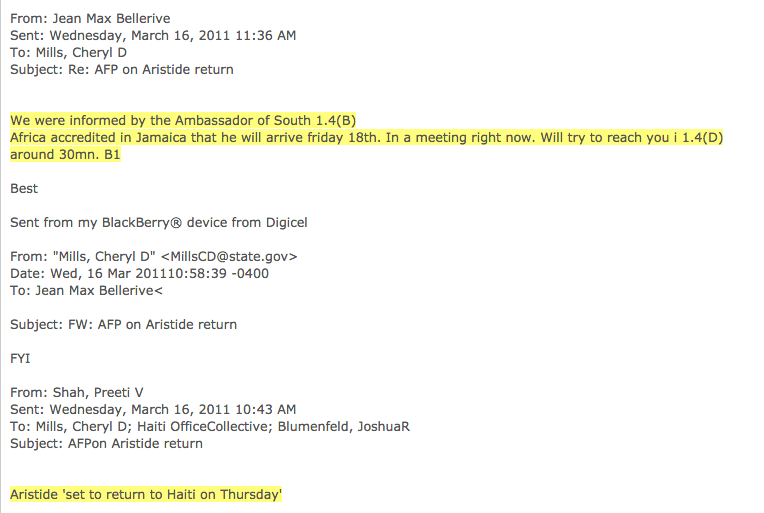 10:45 am Jean Max Bellerive tells Cheryl Mills Aristide is set to return on Friday, March 18th–not the 17th. 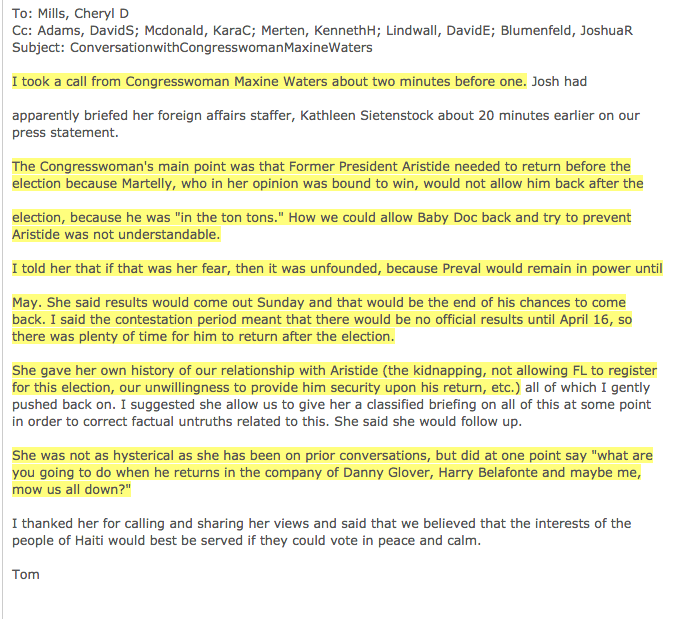 7:13 pm Cheryl Mills reminds Hillary Clinton to speak with Brazil’s Minister of External Relations Antonio de Aguiar Patriota re: Aristide. 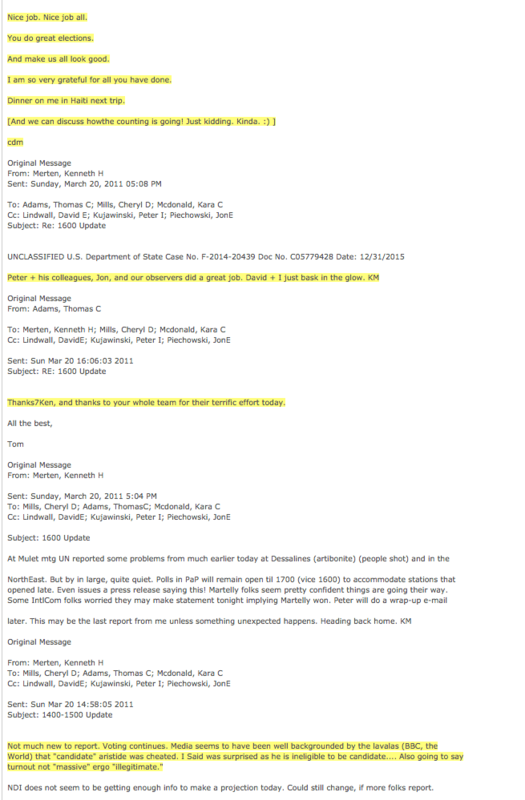 A subsequent email from Clinton stated that she saw Mills’ email after speaking with Patriota. 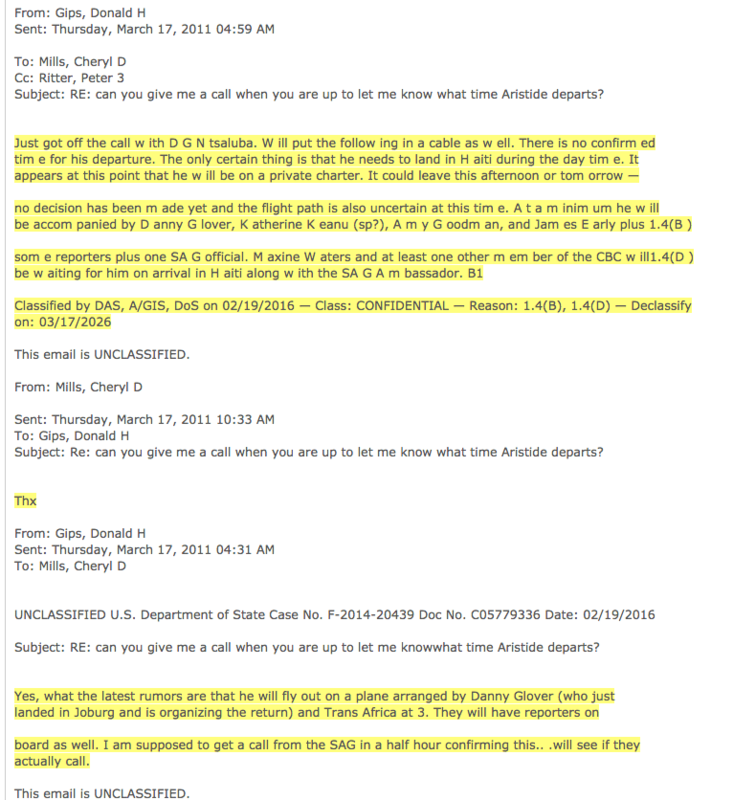 2:00 am – 4:30 am Cheryl Mills questions US Ambassador to South Africa Donald H. Gips re: Aristide’s departure and if he will be accompanied with Danny Glover. 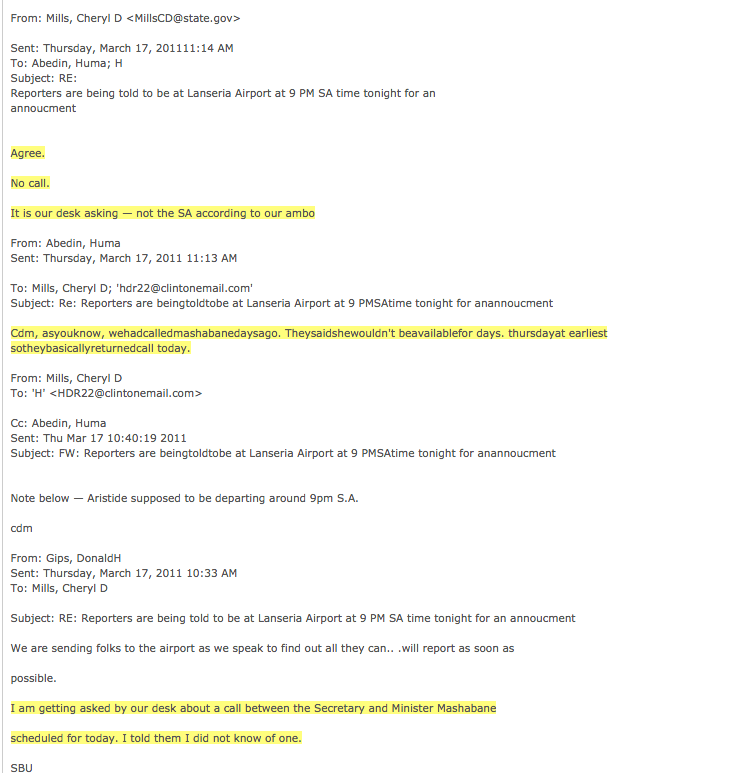 4:30 am – 5:30 am Gips confirms that Danny Glover will be with Aristide and that Rep. Maxine Waters will be waiting for his arrival in Haiti. 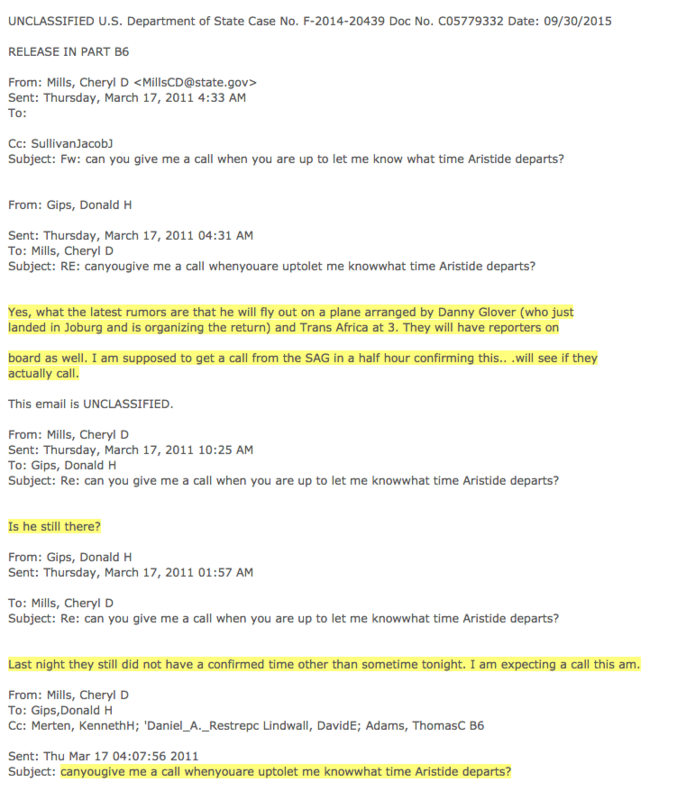 10:25 am -10:40 am Cheryl Mills sends out email confirming Aristide will be departing around 9:00 pm. 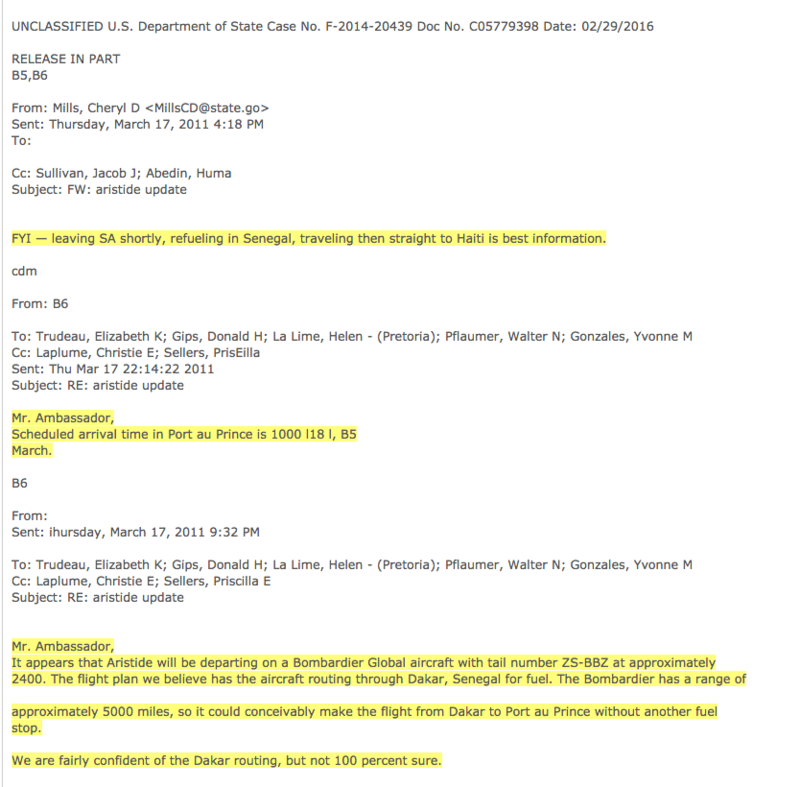 9:30 pm The make of the plane, tail number, flight plan, and time of departure for Aristide is passed along to Cheryl Mills who forwards the information to (redacted), Jacob Sullivan, and Huma Abedin.